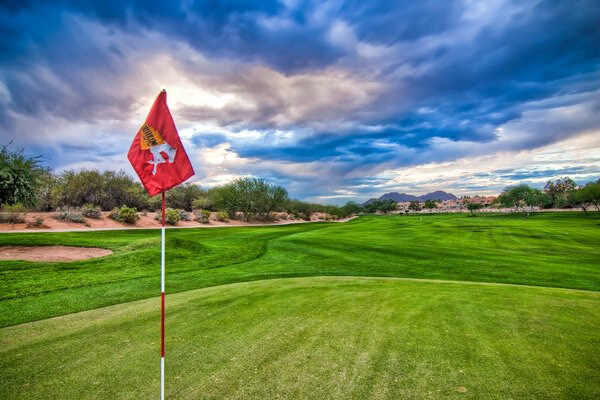 Starfire Golf Club is a 27-hole traditional golf facility located in the north central area of Scottsdale, Arizona. Designed by Arnold Palmer, the (3) 9s consist of King, Squire and Hawk. Each combination of 18-holes is very player friendly. Flat terrain, wide, generous fairways, and striking mountain views provide a peaceful feeling while the demand of the city surrounds you. Resort style in layout, Starfire illustrates rolling greens and dazzling water holes that are sure to demand your attention. Mature trees line the fairways hiding some of the well manicured sand bunkers. All 3 courses are similar in style and offer amazing views of the McDowell Mountains. Multi tee placements and simplistic layout make Starfire Golf Club a course a fun and relaxing experience. From Phoenix Sky Harbor Airport: Follow the airport signs to the Loop 202 E. toward Tempe. Merge onto Loop 202 E. and continue 3.7 miles. Take the Loop 101 N exit via exit # 9. Continue 9.5 miles and exit Shea Blvd. via exit # 41. Keep left at the fork in the ramp. Merge onto E. Shea Blvd. Turn right onto Hayden Rd. Course will be located on the left hand side of the road.